George McGeachie turns to celebrate after scoring the only goal in Raith's 1-0 win over Hibs in the Skol Cup. On Wednesday, August 29, 1990 the drinks were on Raith Rovers as the First Division side took the scalp of Premier League Hibs in the Skol Cup. 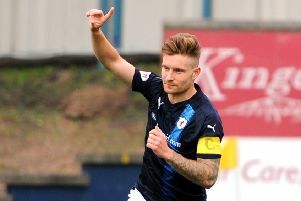 A magnificent header in the 24th minute from midfielder George McGeachie was the difference between the sides and the win put Raith into the quarter-finals of the competition, where they met Rangers at lbrox. Whilst that meeting would end in defeat, the shock result against the Edinburgh side was no more than Rovers deserved on the night against a Hibs side with future Scotland goalie Andy Goram between the sticks. The report in the FFP read: A crowd of just under 5000 – disappointing considering the prospect of an act of giant-killing – watched a superb cup-tie in which Rovers more than matched their full-time opponents. They played with conviction, determination and more than a modicum of skill. Rovers manager Frank Connor stated his intentions from the start by fielding three strikers, with Ian Ferguson held in reserve on the bench, and his players responded magnificently. They were anything but overawed at the prospect of tackling the Easter Road men. They weathered the storms which came their way, played themselves out of trouble with relative ease, and came very close to exploiting the gaps at the back as Hibs pushed forward. The player who stood between Rovers and a place in the last eight was Easter Road striker Keith Houchen who looked menacing every time the bail dropped into the penalty box, but he was very much a one-man task force, over-shadowed by the towering figure of Shaun Dennis. The central defender spent the entire evening monitoring his every move. The fact that Houchen virtually disappeared from view after the half-time break can be put down to Dennis’ presence and immaculate reading of the game. It really was a case of no happy returns for Hibs who came back to Stark’s Park just one week after struggling to beat Meadowbank in a second round tie. This time there was to be no reprieve. Martin Nelson was the architect of Raith’s opening gambit, despite playing in a rather deep role in the early stages. He created space down the left. Coyle picked out Dalziel with a fine cross, and the striker could have done better with a glancing header which lacked direction. While Hibs used the width of the park with limited success, Raith opted for a more direct approach, and it soon paid dividends. In the 20th minute, MacDonald gave his marker the slip, and angled a shot towards the far post. Andy Goram came under pressure from Logan, but still produced an excellent one-handed save. Four minutes later, however, he could do nothing to stop Raith going into the lead. Fraser lofted a free-kick to the far post where McGeachie evaded the defence, and sent a fine header into the roof of the net. In the 37th minute, Paul Wright’s delicate touch carved out an opening for Houchen, but a superbly timed tackle from Dennis halted him in his tracks. One minute later the striker took off to meet a high cross only to discover that Raith’s number five was one move ahead of him. Houchen probably had his fingers crossed when the ball landed at his feet just yards from goal in the 39th minute, but it was just not his night. He got himself into a dreadful muddle and Arthur quickly smothered the danger. Rovers started the second half with Ian Ferguson on for Kenny MacDonald, and Hibs swiftly introduced Gareth Evans for Farrell – “about time too” – was the verdict from the centre stand. The Edinburgh men then started to build from the back in a bid to get back on level terms. In the 54th minute, Goram thumped a hefty clearance deep into Rovers’ half. Fraser failed to block, and Evans quickly pounced on the loose ball, but wasted a good opportunity with a poor cut back. Rovers responded with a cavalier move down the park. Dennis cleared his lines with a solid header. Logan took up the running in the centre of the park and sent a tremendous cross into the box. Ferguson came sliding into the fray, but failed to make contact. As Hibs committed more and more men to attack, Raith inched closer and closer to the breakaway goal which would have killed the game. In the 71st minute Dalziel darted to the bye-line and played the ball to Ferguson standing in front of goal. All he had top do was turn and shoot, but got himself into a complete tangle, and the chance was lost. Hibs launched an immediate counter-attack, and Evans brought the best out of Gordon Arthur with a fine 20 yard drive. The keeper threw himself towards the top left hand corner to tip the ball away for a corner. In the 77th minute Logan flicked the keeper’s long kick to Dalziel who cut inside before letting fly with a fierce angled drive which was deflected away for a corner. The last ten minutes were almost impossible to watch as Hibs battled for their lives, and Raith simply played themselves out of trouble with the minimum of fuss. Five minutes from time Houchen burst into life when he accepted a through ball, but the Easter Road men’s glimmer of hope was quickly shattered by Dennis’ superbly timed tackle. Raith Rovers: Arthur, McStay, MacLeod, Fraser, Dennis, McGeachie, Logan, Dalziel, MacDonald (Ferguson S45), Coyle, Nelson (Burn 88). Hibs: Goram, Miller, Mitchell, Kane, Cooper, Farrell (Evans 849), McGinlay, Wright (McGraw S74), Findlay, Houchen, Tortolano.